Those who read last Saturday’s Irish Times Marbella Feature online may be scratching their heads. The piece appeared, but the associated properties didn’t materialise. They are included in the hard-copy version of the paper, in the ‘Home & Design’ section, which was published on Saturday May 7th 2016. For those of you who missed out on the properties in the online version. 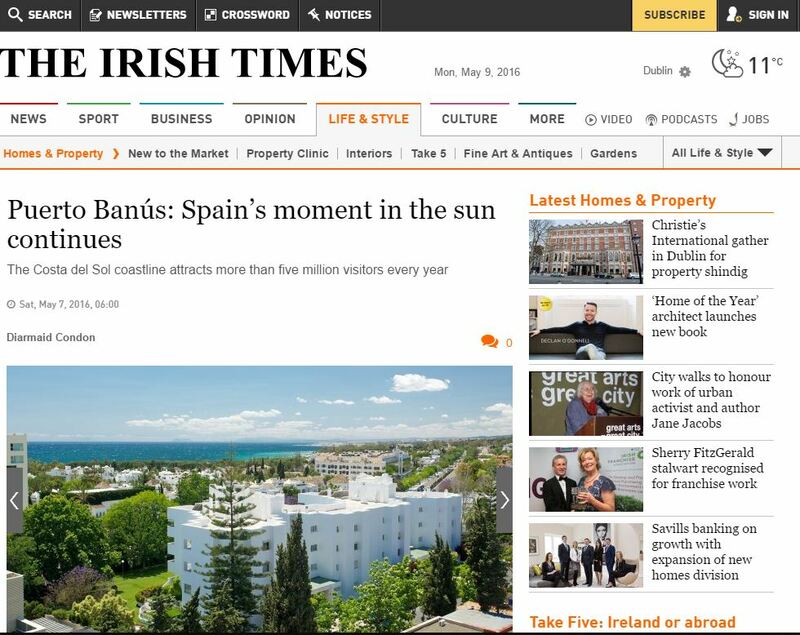 By the way, those who know the Costa del Sol coastline may well have noticed that the tag line on the article claims that the coast ‘attracts more than five million visitors every year’. This is incorrect. It may well have been taken out of context somewhere along the way, Puerto Banus alone attracts over 5 million visitors every year, the Costa del Sol is host many multiples of this annually. I’ve included the properties in the piece below. Being a port area, Puerto Banus isn’t traditionally associated with beach property, even though there are some lovely sandy stretches on either side of it. 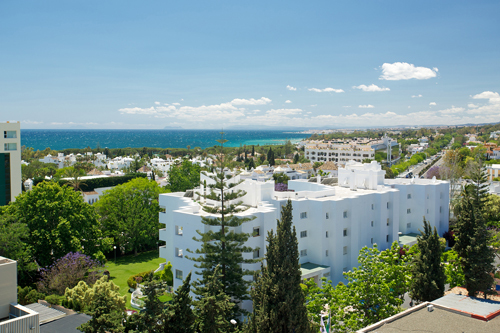 The Playa Rocio beachfront development (pictured above) is located on the first stretch of beach after the port heading toward Marbella. Prices start from €300,000 for a 60 sq. m. ground floor 1 bedroom apartment. 100 sq. 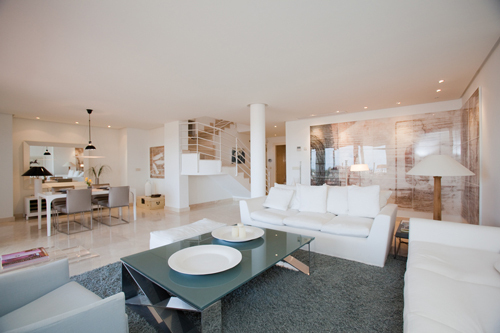 m. two bed units are available from €370,000 with three bed units available from €395,000. For further information contact Deluxe Properties on 01 685 3278 or visit www.deluxeproperties.ie. Also close to the port, Smart Property Professional is promoting Vista Real (pictured above), a newly renovated development with prices starting from €165,500 for a 120 sq. m., 1 bed, 1 bath apartment with two parking spaces and a communal swimming pool. Each unit has a terrace offering sea views. Middleton based Colbert & Co is offering a 159 sq. m., first floor, south-facing, 2 bed apartment in sought after Embrujo Playa (pictured above), a 10 minute walk to the port. Large living/dining area, terrace overlooking gardens, double en-suite bedroom, 24 hr. security. The asking price is €425,000. 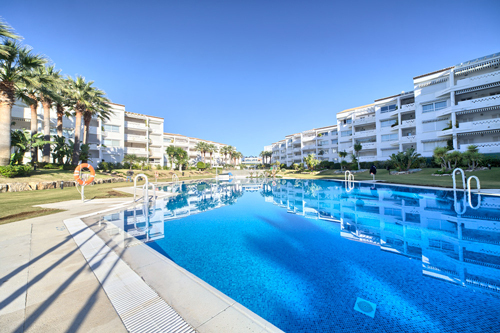 Jardines Principe (pictured above) offers new high spec apartments in 6,500 sq. m. of tropical gardens. Prices starting from €639,100 for a 134 sq. 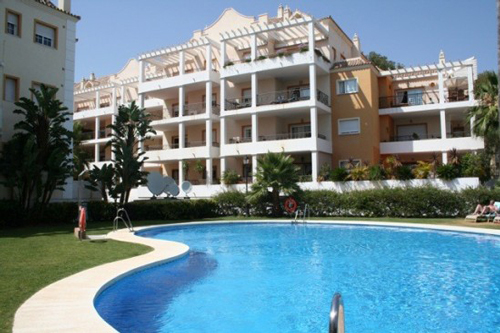 m., 2 bed, 3 bath apartment with storage area, parking spaces and a communal swimming pool. Further information at www.smartpropertyprofesssional.com or +34 951 239 866. 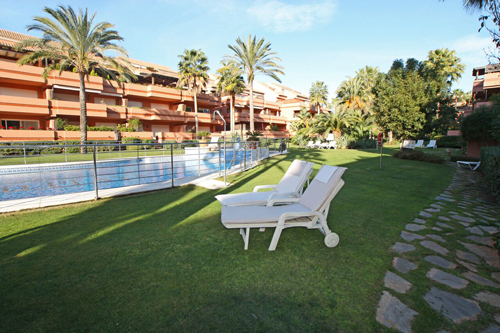 Next to Las Brisas golf club is River Garden, newly built 149 sq. m. 2 bed, 2 bath apartments with south-west facing terrace, AC, alarm and fireplace. It features well maintained tropical gardens and a communal pool area. Prices start from €177,800. Visit www.colbertandco.ie or you can call Colbert & Co. on 021 463 9557.